Butlers Barn01760 338991work Self-cateringButlers Barn offers a self catering holiday apartment set in the 'East Wing' of Butlers Barn, a large converted beamed wing of a barn conversion set in 10 acres of farm land. Facilities: Dining area with dining table and chairs three piece suite to living area. Fully fitted kitchens which include fridge/freezer, microwave and conventional cooker. Modern electric showers & bath. Wooden/tiled floors throughout with fitted carpet to living area the wing is set all on one floor. All bed linen (duvets) and hand towels are supplied at no extra charge. Cots, cot linen and high chairs are available upon request. Central heating and electric are all inclusive. The village of Narborough offers Trout Lakes and nature walks popular with fisherman, villagers and visitors. Only 10 miles away on the banks of the River Great Ouse is the town of King's Lynn brim full of maritime heritage & historic buildings. The market town of Downham Market can also be found close by. Swaffham is a nearby market town, every Saturday the Market Place is filled with stalls as local food producers vie for attention with everything from antiques to clothing. Just off the Market Place is the Church of SS Peter and Paul, one of the finest medieval churches. 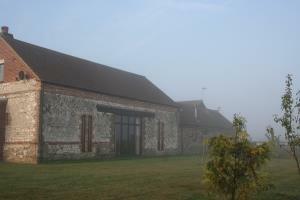 Butlers Barn offers weekly bookings starting on Saturday. Butlers Barn offers a self catering holiday apartment set in the 'East Wing' of Butlers Barn, a large converted beamed wing of a barn conversion set in 10 acres of farm land.